1 cup each of flour and coffee grounds (used or unused), 1/2 cup each of salt and water, shells, pasta or other items to make impressions. Combine coffee, flour, salt and water in a bowl. (Add water slowly.) Stir and mix well. Shape the mixture into “patties.“ Use shells or other materials to make an imprint, or use pieces of pasta to represent the bones of a dinosaur. Allow them to dry overnight. The word Fossil comes from the Latin fossils meaning ‘dug up’. They are defined as the remains or traces of plants or animals that lived a long time ago. Fossils are usually preserved in sedimentary rocks such as sandstones, shale or limestone. How are fossils formed? What common types of plants and animals are found as fossils? Zipper type bag (sandwich size), water, sharpened pencil. Fill the zipper type bag 2/3rd full with water and seal the bag. Carefully, yet firmly and quickly, poke a sharpened pencil all the way through the bag so it protrudes from both sides of the bag. Plastic bags are made of long chains of polymers (picture a bowl of cooked spaghetti before you add sauce). When you poke the pencil in the bag you are moving those strands a part. The elasticity of the bag pushes the strands back along the sides of the pencil, sealing the bag and keeping the water inside. When the pencil is removed, the strands will not completely return to their original position and the water will flow out of the holes. Ask the students to predict what will happen before you stick the pencil into the bag. What if you used different brands or sizes of zipper type bags? Different types of pencils? Different volumes of water? Curl the paper strip into a hoop, taping the ends together. Tape the small hoop to one end of the straw, and the big hoop to the other end, making sure they are lined up together. Hold your Hoop Glider in the middle of the straw, with the small hoop in front and throw it gently like a paper airplane. If you throw a plain straw, it doesn’t go very far. 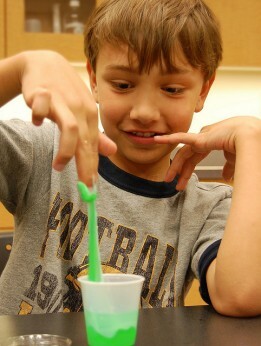 But when you add paper hoops, the straw glides through the air. That’s because the hoops act like wings. Things that fly—like insects, birds, and airplanes—all have wings. Try changing the size of the hoops on your glider. How does it fly with different sized hoops? Why?